You might think that to get an effective weight-training workout you need to be in the gym for a long time. That certainly is not the case, as just 30 minutes of weight training can be an awesome strength-building, fat-burning workout. The shorter session duration may even help you maintain focus so you get even more out of your time in the gym. Whether you go for a full-body routine or a split workout, the guidelines you follow should be the same. Pick four or five compound exercises per session. Start by performing one to two very light warm-up sets of each exercise before getting into your working sets. 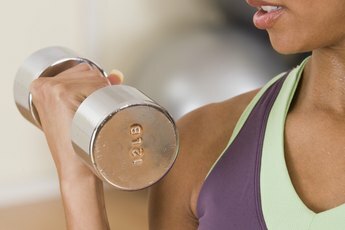 Aim for three sets of eight to 12 repetitions of each using a weight that is challenging but manageable. Each week, try to increase the weight slightly, or do an extra few reps. Should you plateau on a lift, find another exercise that works the same muscle groups. For example, back squats could change to front squats, pushups to dips or dumbbell rows to seated cable rows.